The herbal medicines product are the first choice among people to avoid adverse health effects. According to the Council for Scientific and industrial Research (CSIR), 2017, traditional medicines are mostly preferred for treating health problems as compared to allopathic medicines. Moreover, allopathy cannot be effectively remedied at around 70% due to which traditional medicines have an important role to play in meeting with equitable healthcare delivery goals. According to the World Health Organization (WHO), 2017, Ayurvedic medicine is the sum of the knowledge, skills, and practices which are mainly based on the theories, beliefs and experience to different cultures used to maintain health in terms of prevention, diagnosis, and treatment of physical, and mental illness. Increasing adoption of herbal medicinal product over conventional allopathy with fewer side effects is expected to boost growth of the herbal medicinal products market during the forecast period. The medicinal value of herbal product provides tremendous opportunity in India, which could play a leading role in growth of the global herbal medicinal products market over the forecast period. The key players operating in herbal medicinal products market include Sanofi-Aventis Healthcare PTY Ltd., Arkopharma Laboratories, Himalaya Global Holdings Ltd., Integria Healthcare, Young Living Essential Oils, MOUNTAIN ROSE HERBS, Boiron USA, Nutraceutical Corporation, TSUMURA & CO. and Blackmores. The global herbal medicinal products market was valued at US$ 119.37 Billion in 2016 and is expected to exhibit a CAGR of 6.98% over the forecast period (2017 – 2025). The global herbal medicinal products market is gaining significant traction due to launch of e-commerce for easy access of Ayurvedic therapies and supplements, changes in government regulations to promote herbal medicines, and the increasing expansion of herbal medicinal product worldwide. For instance, in September 2017, Dabur India collaborated with Amazon India to launch an Ayurveda e-marketplace. Through this e-commerce, Amazon will offer various ayurvedic medicines such as Nutriherbs Shilajeet, Himalaya wellness pure herbs ashwagandha, and Herbal Hills for treatment of variety of illnesses (gut and digestive problems and diabetes). Consumers will able to gain easy access to all Ayurvedic brand solutions (Dabur, Patanjali, and Himalaya) available in India. Furthermore, in November 2017, the Union Ministry of Health and Family Welfare, India, has strengthened regulation regarding homeopathic medicines under the drugs and cosmetic rules, 1945. According to the new regulation, homeopathy doctors are banned from selling homeopathic medicines over the counter at clinics. Also, pharmacist will no longer require special practicing in homeopathy outlets for consultation purpose. This law will allow the pharmacist to sell homeopathic medicines along with the allopathic medicines. Furthermore, the Good Manufacturing Practices (GMPs) of homeopathic medicines are followed by pharmacopeia standard. For instance, new law is expected to reduce the demand for raw materials to be free of organic and inorganic matter and will replace with pharmacopeia standards. Thus, these changes in law regarding homeopathic medicines are projected to make India’s regulation more specific and rigorous. In November 2017, Australian beauty brand CANVAS expanded its presence in Singapore with the Maiko Pte Ltd to, a distributer, which will help with sales, marketing and brand-building activities of CANVAS and its aromatherapy products. With this expansion CANVAS will be able to strengthen its product portfolio in aromatherapy and enter into the global herbal medicinal products market. In August 2017, the National Health Service England announced that the homeopathic medicines would no longer require prescription in the UK. Furthermore, in November 2017, according to the Le Figaro report, France is the biggest users of homeopathic remedies. More than a third French people use homeopathic treatments. As per the Le Figaro report, global company, Boiron is a leading manufacturer of homeopathic medicines, which earns 55% of its revenue in France alone. This in turn is anticipated to boost growth of the herbal medicinal products market over the forecast period. The amount of side effects triggered by ingestion of allopathic medicines are increasing rapidly, which is a major concern among the population. Moreover, herbal medicinal product comprises plant extract such as alkaloids, phenols, terpenoids, polysaccharide, glycosides, and resins, owing to its medicinal properties and serve as an alternative source of medicines over conventional allopathy for various body aliments such as gut and digestive problems, hypertension, and other illness. This has intensified the use of herbal medicinal formulations and preparation from many industries such as supplements, pharmaceuticals, and others. Also, increasing inclination of consumers towards a green label product, increasing demand for herbal medicines and its practice from the literature of Unani and Ayurveda is fueling growth of the herbal medicinal products market, owing to less side effects and non-toxic properties. Furthermore, increasing prevalence of diseases such as digestive problems, flu and kidney failure has demand for a cost-effective cure, which is expected to expand the global herbal medicinal products market over the forecast period. Herbal medicinal products market is gaining significant traction due to inclination of consumers from conventional medicines to traditional medicines worldwide. For instance, in November 2017, Organic Aromas, a leading manufacturer of aromatherapy partnered with McGill University in Montreal, Canada to improve and educate on aromatherapy. The aim of this unique projects was to promote correct use of essential oils, develop superior understanding of aromatherapy, and identify and formulate the ‘best practices’ for the aromatherapy industry. Furthermore, in November 2017, Organic Aromas launched a ground breaking organic pure essential oils with forty different blends, which has greater aromatherapy effectiveness. Also introduced its first wireless rechargeable Nebulizing Diffuser aromatherapy device, which is sleek and effective with potential therapeutic benefits. Therefore, launched of such products is expected to drive growth of the herbal medicinal products market. However, lack of awareness regarding herbal therapeutics among people and un-clear laws to use herbal ingredients for medicinal formulations may hinder the market growth. This report provides in-depth analysis of the herbal medicinal products market and its product type, dosage forms, market size (US$ Million), and Cumulative Annual Growth Rate (CAGR %) for the forecast period: 2017 – 2025, considering 2016 as the base year. 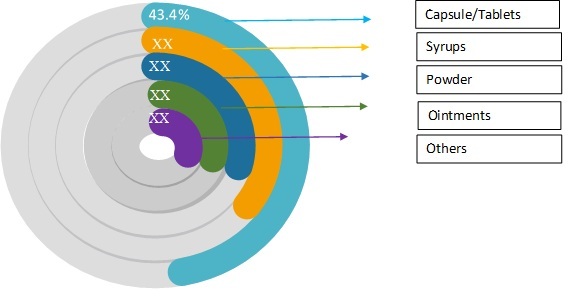 It profiles leading players in the herbal medicinal products market based on the following parameters – company overview, financial performance, product portfolio, geographical presence, distribution strategies, key developments and strategies and future plans. Key companies covered as a part of this study include, Sanofi S.A., Arkopharma Laboratories, Himalaya Global Holdings Ltd., Integria Healthcare, Young Living Essential Oils, MOUNTAIN ROSE HERBS, Boiron USA, Nutraceutical Corporation, TSUMURA & CO. and Blackmores. Insights from this report would allow marketers and management authorities of companies to make informed decision with respect to their future product launches, distribution channel upgrades, market expansion, and marketing tactics. The herbal medicinal products market report caters to various stakeholders in this industry, including investors, product manufacturers, distributors and suppliers for herbal medicinal products market, research and consulting firms, new entrants and financial analysts. Various strategy matrices used in analyzing the herbal medicinal products market would provide stakeholders vital inputs to make strategic decisions accordingly. *Browse 35 market data tables and 41 figures on "Herbal Medicinal Products Market” - Global forecast to 2025”.